One of these things is not like the others. Maybe. This is something that you will probably encounter many times on your vegan journey. In the beginning, it is a constant exercise in ingredient reading. You go down the list. You keep going until you find that one thing (or maybe more) that is not like the others. That one ingredient that isn't vegan just stops you in your tracks. Worse is when you find an ingredient that could be either vegan or from animals. Becoming vegan is about making choices ever single day about everything that goes in your mouth. It can be frustrating. Animal products are in so much food. (And things that aren't food, but I will get to that later.) Some ingredients are easy to recognize. Eggs are an easy one to spot because you can just look for the allergy warning. Contains: Eggs. In bold writing on every label. It's as easy as that. But what about everything else pictured here? Can you spot the one thing that might not be vegan? Vegenaise Original ingredients: expeller-pressed canola oil, brown rice syrup, apple cider vinegar, soy protein, sea salt, mustard flour, lemon juice concentrate. These are pretty simple ingredients. Nothing stands out there, and, of course, Vegenaise is something you kind of have to go out of your way to find and it's well-known that it is a vegan substitute for mayonnaise. What does stand out to me here is how on earth they make it so much like mayonnaise with just those ingredients. I would be hard pressed to try to duplicate this type of sorcery in my own kitchen, so I will keep paying the $5 per jar. Those Boca burgers are kind of dry and need some sort of sauce, after all. Now, figuring out which Boca burgers are vegan is easy, too. They say it right on the package several times. Potatoes and tomatoes are obviously vegan because they are -- duh -- plants. And really, one of the best and fastest ways to figure out if something is vegan is just to make damn sure it came from a plant and didn't come in a package at all. No guesswork involved. If we were all smart, we'd just eat this way most of the time. But there are a few things here that could be questionable. And what about the sugar? Did you know that some sugar is processed through the burnt bones of animals? Becoming vegan is a learning process and in time, you will learn about many ingredients that you thought were free of animal products, but actually are not. I will talk about sugar another day as well, but for now, here is something wonderful to know about becoming vegan: You have a support network! You have a team! It takes a village and a huge one exists here on the Internet. I know that this brand of Sriracha is vegan because other vegans have gone out and done some legwork for me. 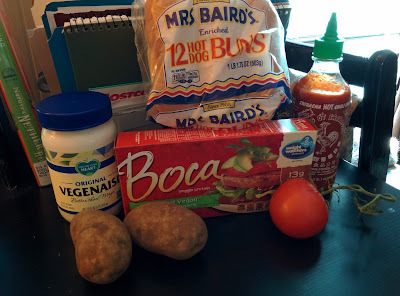 For example, over at Is It Vegan, you can check out many ingredients and products including Sriracha. Not only that, but there is often discussion about whether or not individual ingredients are vegan or not and clarifications can be found in the comments. For instance, in this case, sugar is discussed and the author actually posts a letter from the makers, Huy Fong, where they confirm that they use beet sugar, which is not processed with bone char. Sometimes you might find that someone has called or written a company, but the information is old and the formula or recipe has changed. Usually those in the vegan community are quick to comment on these posts and make corrections, so read the comments and double check dates. But do lean on these great folks who want to help you get it right. So, what's left here is the bread. You'd think that bread would be vegan, but sometimes the very obvious eggs, milk and honey are in there. If you've ever made your own bread, though, you know that it can be made with just a few very vegan ingredients. Here's what these buns have: enriched flour [wheat flour, malted barley flour, niacin, reduced iron, thiamin mononitrate (vitamin b1), riboflavin (vitamin b2), folic acid], water, high fructose corn syrup, yeast. Contains less than 2% of: soybean oil, salt, wheat gluten, monoglycerides, calcium propionate (preservative), calcium sulfate, grain vinegar, datem, soy lecithin, citric acid, potassim iodate. If you do an ingredient-by-ingredient lookup, like you can at the Vegetarian Resource Group, then you will find that everything here checks out all right except for the datem / monoglycerides. These could be animal derived but are listed as "Typically Vegan." These hot dog buns were what we had already on hand, and I didn't want to waste them or make a special trip to buy my own bread (my son and husband are not vegan, by the way, which is also a story for another day). I decided to settle for the Mrs. Baird's hot dog buns. Sometimes, at the end of the day, going vegan is about settling just so you can eat. I know someone will come on here and argue with me or talk about how easy it is, but I'm just being honest about what you might face and the type of person I am. Reality is that I don't want to waste food that is right in front of my face. Reality is also that settling on the non-vegan thing too many times will lead you down the slippery slope of not eating vegan at all. Reality is also that being too uncompromising and unyielding can just as quickly lead you down that same slope. I will talk about all of these things because I have lived them. It's ugly sometimes. But mostly it's not. The alternative is uglier. To be sure, I could have made my own bread. I probably should have made my own bread. But make my own bread I did not. To be sure, I could have done without bread completely, but I did not. That was a choice I made. That was a conflict I fought inside my brain and the little devil on my shoulder saying, "Eat the bread," won this round. There are many who find this to be a very black-and-white issue. (The ingredients might not have been vegan, period, so do not eat / do not pass go.) Others find more grey. (Well, those ingredients are usually vegan and they did comprise less than 2% of the total recipe, so...) I feel that each individual is different and there are a multitude of factors to consider, many deeply personal. In the end, I think you have to do the thing that causes the least harm and also allows you to continue the journey rather than end it completely. And so, yesterday, I chose the packaged bread with a questionable ingredient that is "typically vegan." If ever you had any notions of your own perfection or anything near it, know that you might find going vegan to be a bit humbling. That I even experienced such a conflict about a food ingredient means that I am doing this thing right. I like the ingredient labels that point out the allegens. How convenient for vegans! I really enjoyed this post. I've been waffling between "vegetarian-vegan-to hell with it all it's too hard" for a long time myself. I'm not sure I'll ever claim to be a vegan - I just do the best I can. Good luck to you! Yes, and you know, sometimes I feel that way all on the same day. Ha. It's like I wake up and I'm doing so well. Dinner time comes and oops, what did I just eat?! Then I just want to throw in the towel. It gets better and better though, and you know, "the best I can" changes and improves with practice, so keep on going. I have never met a single vegan of adult age that has been that way since birth, so everyone had to start somewhere!